Today’s recipe is ‘Homemade Garlic Bread’. 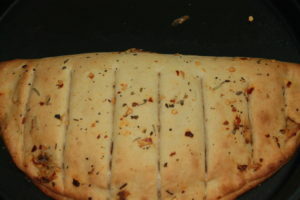 You can prepare famous food joints style garlic bread at home. 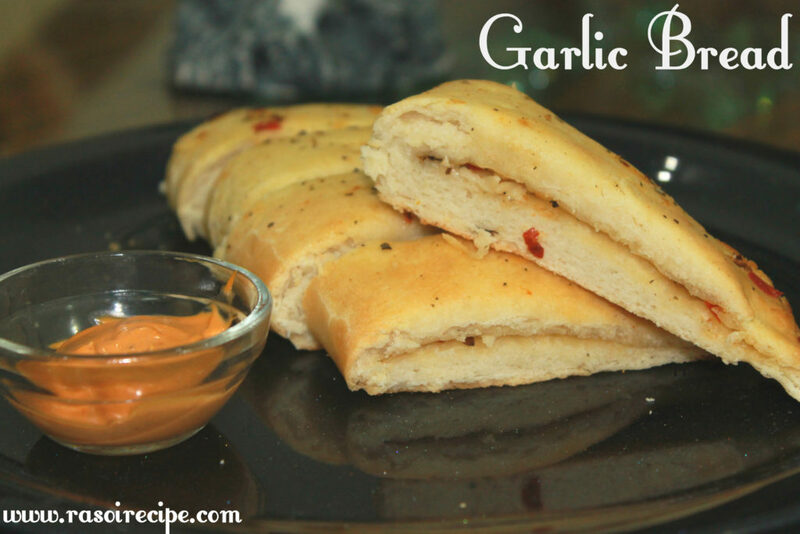 Garlic bread tastes awesome with soup or pasta or noodles, one can try this menu list for their kid’s birthday party also. Homemade and freshly baked garlic bread is my favourite during the winter season. 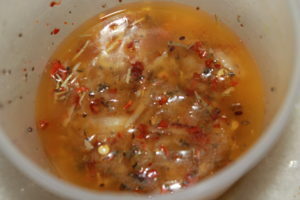 Garlic bread can also be enjoyed as an appetizer or tea-time snack. 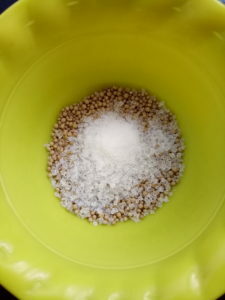 To prepare garlic bread at home, you will need – all-purpose flour/maida, dry yeast, sugar, salt, oil, butter, garlic, oregano, and red chilli flakes. 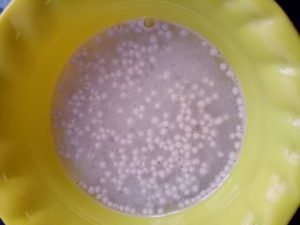 As nowadays, the climate is changing and the temperature is dropping day by day, you need to wait little longer for the dough to get ready. 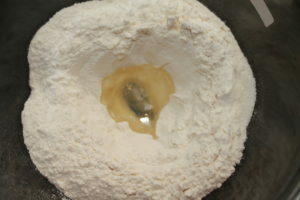 To accelerate the process, you can keep the dough in a place which is warm. 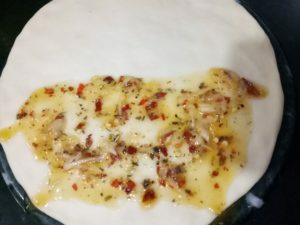 I have shared two more recipes for garlic bread, for which you need readily available french baguette bread, recipes for which you can check here – Cheesy Garlic Bread (with veggie mayo topping), Easy Cheesy Garlic Bread (with mayo chilli dip). 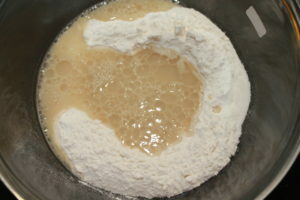 In a mixing bowl, take all-purpose flour. 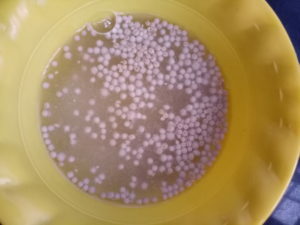 Make a well. 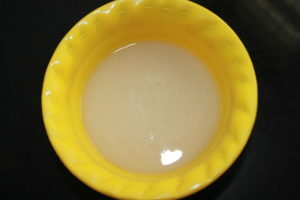 Add yeast-sugar-water mix and oil in the bowl. 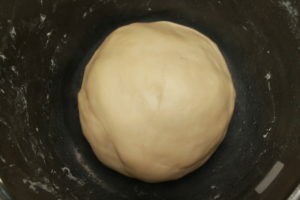 Let the dough rest and double in size. 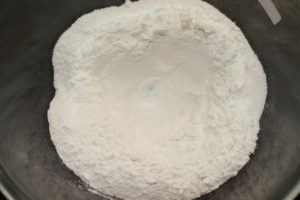 When the dough is ready, dust the surface and prepare a round circle from the dough with the help of rolling pin or fingers. 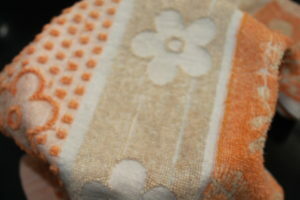 Keep the thickness about a half inch thick. 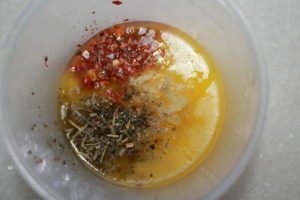 In a small bowl, mix butter, red chilli flakes, oregano and crushed garlic. 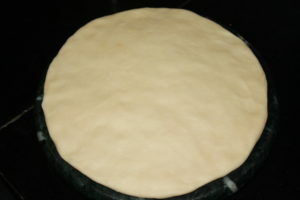 Fold the circle in half moon shape, apply milk and seal the edges. 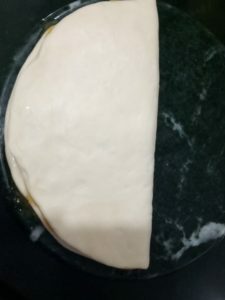 Apply a generous amount of garlic butter mix on the top part of the half moon. 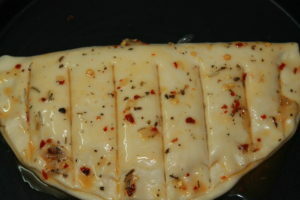 Make partial cuts in strips shape on the top surface. 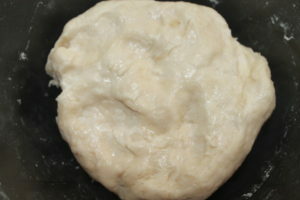 Let the dough rest for 5 mins more. In the meantime, grease a baking tray and preheat oven at 180 C.
Once the garlic bread is cooked, brush it with garlic butter again before serving. 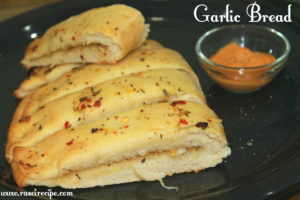 Serve freshly baked garlic bread with any dip of your choice! Thank you so much Aishwarya!